This blog is about everything related to Pietro Mascagni, the famous opera composer. You will find more information about Pietro Mascagni on the Mascagni.org web site. 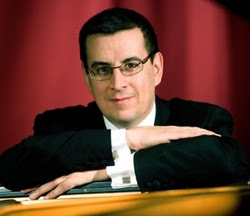 Pianist Marco Sollini is playing today at the Cherry Hill Plantation in North Carolina. Sollini "oversaw the publication by Boccaccini and Spada of the piano music of Puccini, Mascagni, Giordano, Leoncavallo, and Bellini as well as chamber music by Rossini and Mascagni" (as reported in the article linked below).